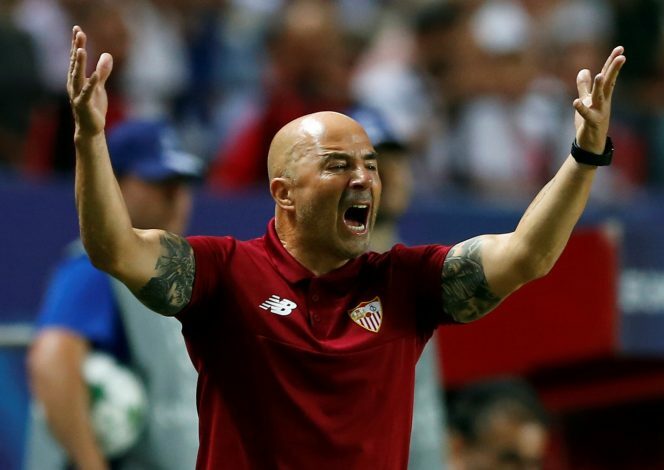 Sevilla boss Jorge Sampaoli has dismissed the rumours linking him with the Barcelona job, by claiming that he is fully committed to his current club. Sampaoli has been heavily linked with a move to Barcelona for more than a month now, and after Luis Enrique recently confirming that he will be stepping down from his managerial position at the Catalan club at the end of this season, the aforementioned links have only got stronger. Barcelona have been rumoured to keep an eye out for the best potential candidates for the job for quite some time, and as per trusted Sky Sports journalist Guillem Balague, Sevilla’s Jorge Sampaoli and Tottenham Hotspur manager Mauricio Pochettino have emerged as the La Liga giants’ topmost priorities. Amid all the speculation, Sampaoli was asked to address these rumours once and for all, following his team’s 1-0 victory over Athletic Bilbao. The Argentine told the reporters: “The Barcelona job? That question has no answer because it doesn’t exist. These comments from Sampaoli will surely come as a huge blow to Barcelona, especially with their star players Lionel Messi and Neymar rumoured to be looking forward to seeing the Sevilla boss take charge at Barca next season. The club will now have to look elsewhere to find a worthy successor for Luis Enrique, and do so soon.